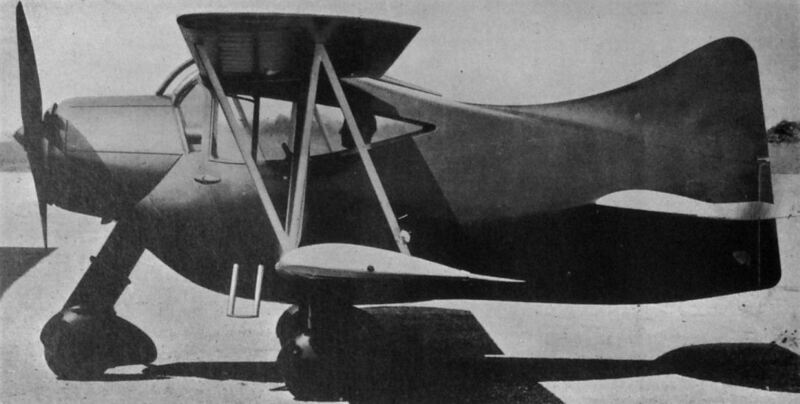 The Gwinn "Aircar" (95 h.p. Pobjoy "Niagara" engine). Like the Model 111, the Gwinn Aircar was a strange-looking aeroplane and the pair are worth comparison. The view from the Aircar cockpit must have been extremely limited. The first Aircar was produced in 1937 and was powered by a Pobjoy Niagara II engine. A second Aircar was also completed and had a Niagara V engine. The makers claimed that it was impossible to spin or stall the aircraft. The elevators were restricted to a total movement of 8 1/2 degrees and there was no rudder. DATA: Span 24 ft., length 16 ft. 3 in. ; weight, empty 1,099 lb., loaded 1,532 lb. ; maximum speed 118 m.p.h., cruising speed 103 m.p.h. ; range 495 miles. Accommodation was for two persons in side-by-side seats. The Gwinn Aircar typify the present American trend toward three-wheeled undercarriages. This machine is offered as a practical private-owner type. A Pobjoy powers the Gwinn. 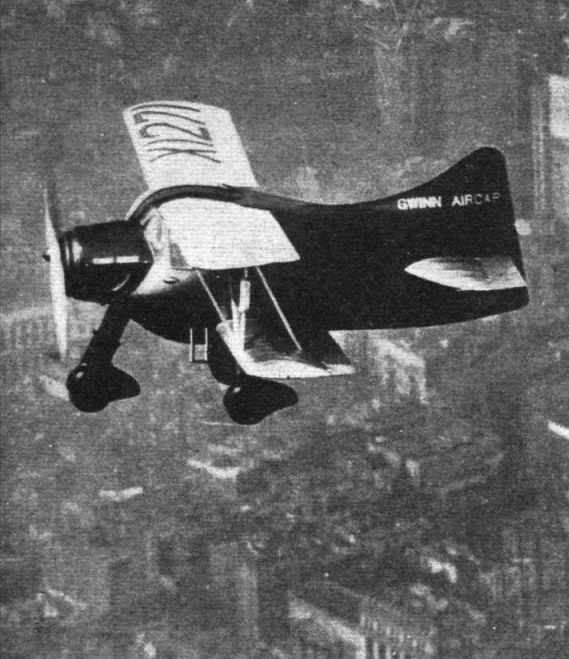 BIZARRE: The Gwinn Aircar is flown by its demonstrator, Lt. Cdr. Frank Hawks, over New York. Though its control system and flying characteristics are designed to make this quaint machine virtually foolproof, the urban paraphernalia below looks no less uninviting to the pilot of a single-engined machine.